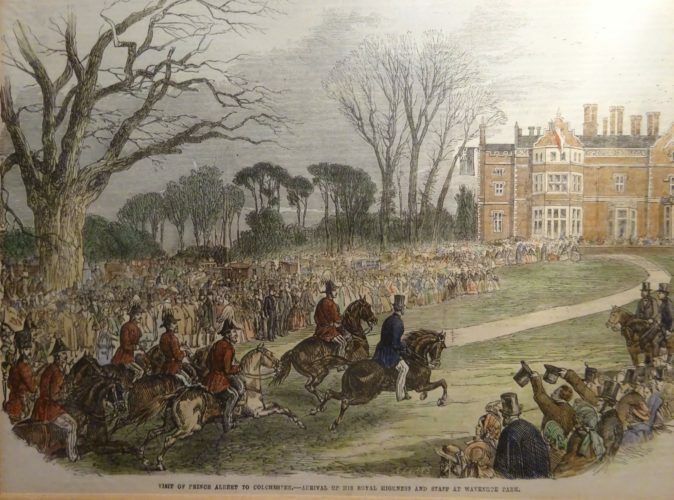 A report from the London Illustrated News about Prince Albert’s visit to Colchester on 21st April 1856 to inspect the new barracks which had only been built in 1855. As some of the troops were on exercise in Wivenhoe Park, presumably at the invitation of Mr Gurdon Rebow, owner of Wivenhoe Park. The visit of his Royal Highness to Colchester for the purpose of inspecting the troops stationed in the Encampment there took place on the 21st ult. (last month). The streets were lined with well-dressed people, and all business was suspended. Banners and flags were all profusely displayed in all directions. His Royal Highness, who was accompanied by General Grey, Colonel Phipps, General Wetherall, and Lord Alfred Paget, was received at the station by a guard of honour furnished from the 11th Regiment, and a detachment of the West Essex Yeomanry. At the Townhall (sic), the Prince was met by the Mayor, Mr C.G. Round (Recorder), Mr Turner (Town Clerk), and other gentlemen. His Royal Highness having been conducted to the large room of the building, an address from the Town Council was read by the Recorder, in the presence of a numerous company, comprising the elite of the town and the district, to which his Royal Highness gave an appropriate reply. The Prince, on leaving the Townhall (sic), proceeded to the Camp, and was conducted over it by Barrackmaster, Sir William O’Malley, and other officers. The Camp covers a great extent of ground, and contains a church, three schoolrooms, quarters, a mess establishments for the various officers, and about 130 huts for the rank and file, together with two powder powder-magazines, 20 hospital huts, stables, lavatories, cooking-houses etc. Four roads, three of them 90 feet in width, intersect the lines of buildings, and the general appearance of the Camp is airy and cheerful. The regiments of the Line lying in the Camp are the 11th and 88th and the following Militia regiments: – The Essex Rifles, the West Suffolk, the West Essex, and the East Norfolk. The Commanding officer of the whole force is Major-General Gascoigne. Having concluded his examination of the Camp, the Prince proceeded to the business of the day – the review of the troops, who were drawn up in line in Wivenhoe Park under the command of Major-General Gascoigne.